Once your child reaches high school, figuring out how to pay for college starts to loom large in your mind. An important step in getting ready for the costs of college is filling out the FAFSA (Free Application for Federal Student Aid). 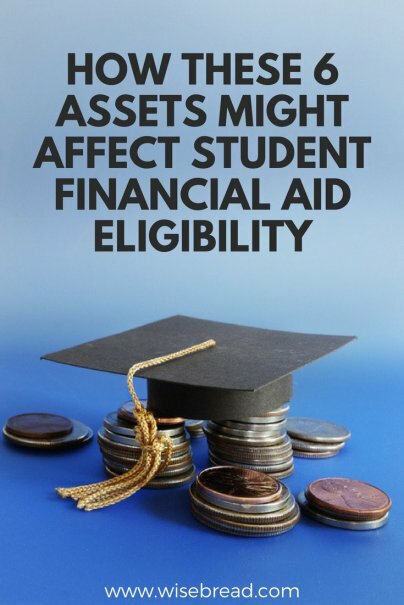 This paperwork helps determine how much need-based financial aid your student qualifies for. And before you assume that you make too much money to get any such assistance, remember that families earning as much as $180,000 per year can qualify for some form of financial aid. Here's what you need to know about the asset and income calculations for need-based financial aid. To determine your student's financial aid package, the college financial aid office starts by determining the cost of attendance and the expected family contribution, or EFC. The EFC amount is calculated based upon the information you provide on the FAFSA. In general, assets and income held by the dependent college student count for more in the EFC formula, while parents' assets and income count for less — and some parental assets are not included in the calculation whatsoever. 20 percent of the student's assets, which includes savings, investments, business interests, and real estate. 2.6 to 5.64 percent of the parents' same types of assets (based on a sliding income scale). 50 percent of student income above $6,570. 22 to 47 percent of parent income above $25,040 (also based on the sliding scale). As of 2017, the FAFSA began requesting the prior-prior year's tax return from filers. This is called the "base year." Before the change, families had to provide the prior year's tax return (that is, the immediate previous year) as their base year information. For instance, for the 2011–2012 school year, FAFSA filers had to provide their 2010 tax return, but filers filling out the FAFSA for the 2018–2019 school year will provide their 2016 tax return. There are a couple of reasons why this is an important change. First, it means that families are less crunched to complete their previous year's taxes and a FAFSA form in the same year. Secondly, it also means that families who are actively trying to make income-related plans to lower their EFC need to do such things no later than their child's freshman spring/sophomore fall year. What kinds of income-related plans? For instance, you might max out your retirement savings in the years leading up to the base year, because you are not asked to declare the value of tax-deferred retirement accounts (such as 401(k), 403(b), or IRA accounts) on the FAFSA. However, money that you contribute to your retirement account during the base year is still considered part of your income for the EFC calculation, even though it is pretax income that you have invested. Another important thing to remember about income is how your child's income is counted on the FAFSA. Fifty percent of the dependent student's income over $6,570 is counted in the EFC calculation, and financial gifts are also considered income. For example, if Grandma and Grandpa give your child $10,000 toward college in 2018, 50 percent of the amount over the threshold ($3,430) would have to be counted as income on the FAFSA filed for the 2020–2021 school year, and it could increase the EFC amount (and reduce the aid) by about $1,715. The good news about these accounts is that whether they are in your name or your child's, they are considered parental assets. That means no more than 5.64 percent of the assets in a 529 account or Coverdell ESA will be included in the EFC calculation. So if you have saved $25,000 in your daughter's 529 account, her aid would only be reduced by roughly $1,400. As mentioned above, the value of parental retirement accounts are not included in EFC calculations. However, the money that you contribute to your retirement account during years you fill out the FAFSA is included as parental income, even though you don't actually get to bring that money home with you. Some parents front load their retirement contributions in the years leading up to their child's base year just in case they need to reduce their retirement savings during the college years. In addition, parents need to know that withdrawals from Roth IRA accounts are penalty-free if they are used for qualified college expenses. However, this distribution will count as parental income on the FAFSA for the year of the distribution and potentially reduce financial aid by as much as 47 percent of the amount withdrawn. The FAFSA does not consider the amount of equity in your home when calculating the EFC — although the CSS PROFILE, which is the form required by many private colleges and universities for determining financial aid eligibility, does request this information. This means that federal financial aid does not need to know how much equity you have in your home, but many private institutions will consider it when evaluating your financial aid needs. Since home equity is not part of the EFC calculation, some families with large non-retirement savings may consider paying down (or paying off) their mortgage in the years before the base year. This will reduce your expected family contribution, but it could hurt you if Junior or Sis decide to go to a private college or university instead of InState U. These sorts of custodial accounts are in your child's name, which means that 20 percent of any assets in these accounts are counted toward the EFC. In addition, any interest, dividends, or capital gains earned from these types of accounts (or any accounts in your child's name) are counted as income for your child — which means that 50 percent of that money is counted toward the EFC. Parents who opened a UGMA (Uniform Gift to Minors Act) or UTMA (Uniform Transfer to Minors Act) account for their child's education would probably be better served by rolling the assets over into a 529 account so that less of the money will be considered part of the EFC. If you have additional investments on top of your tax-advantaged retirement accounts, these will also need to be claimed on the FAFSA form. These accounts are counted as assets, meaning up to 5.64 percent of their value will be counted in the EFC calculation. However, any dividends and capital gains earned are counted as income, and any distributions you take from these sorts of accounts are also counted as income. If you need to take distributions from taxable investment accounts to help pay for your child's education, you will also want to wait to do this until at least the spring semester of his or her sophomore year, to keep the distribution from dinging you on the FAFSA.